Green Heron Tools makes ergonomic shovels and other tools designed to reduce injuries and make farming more efficient for all women. 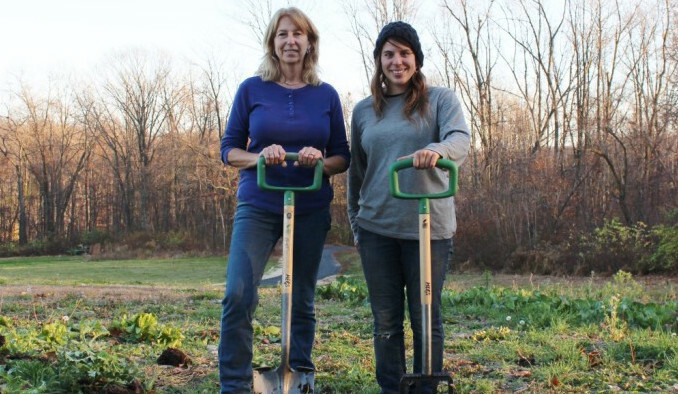 When Ann Adams and Liz Brensinger started a small heirloom vegetable farm in the early 1990s, they called their new venture Green Heron Farms, after the birds that nested in a copse of trees on their property in New Tripoli, Pennsylvania. The name would turn out to be a form of kismet, as green herons are some of the few birds that use tools. Adams and Brensinger, with their backgrounds in nursing and public health, soon learned an important, albeit painful, lesson: Most of the farm tools they used often had been designed for men. For starters, women are usually several inches shorter than men. Shovels and forks are often too long and require a great deal of upper-body strength to work effectively. And pruning shears don’t often fit smaller hands. When women farmers and gardeners have to stoop, bend, or wrench their bodies just to use a tool, they can get hurt. Adams and Brensinger originally thought they’d create an online marketplace of farm tools and equipment made just for women. But they soon found that there weren’t any. And there were no tools that were using true ergonomics backed by science. Not content to just “make do,” as Adams puts it, the two women decided to design their own tools, and Green Heron Farms evolved into Green Heron Tools. In 2009, Adams and Brensinger were awarded an $80,000 Phase I Small Business Innovation Research grant from the U.S. Department of Agriculture (USDA). Working with a team of engineers from the Pennsylvania State University, they researched and designed ergonomic tools to help make farming safer, healthier, and more productive for women. They’ve since received two more USDA grants, totaling nearly half a million dollars. Green Heron Tools released their first tool, the HERShovel, in 2011. The shovel-spade hybrid features a patented D-shaped grip, angled blade, and wide step. It’s lighter in weight than most shovels and comes in three sizes to accommodate differing heights. Last year, they introduced the HERSpadingfork, with the same ergonomic innovations as the shovel. Next on the docket is the patent-pending, battery-powered tiller, which Adams and Brensinger are hoping to license to a manufacturer interested in bringing it to market. They’ve also recently completed researching the needs of nearly 300 women livestock farmers, which could result in more products. Aaron Yoder, who has a PhD in agricultural and biological engineering, worked as a member of Green Heron’s Penn State design team. Yoder, who now teaches at the University of Nebraska, focused his doctoral research on ergonomic tools and machinery for farmers with disabilities, and recognized Green Heron’s scientific design approach as unique. Liz Wagner runs Crooked Row Farm in New Tripoli with her mother, Donna Wagner. Donna bought a HERShovel before they even broke ground on their 3.5-acre farm after meeting Adams and Brensinger. Until then, Liz said, she had no idea any woman-specific farming tools existed—or that they’d be useful. “Before, a shovel was a shovel, with a handle that was usually too tall for me to use with any real dexterity and a blade that often cut into the soles of my shoes over time as I dug,” says Liz. Marvit also uses other tools sold on Green Heron’s website, where they sell products from other companies that may not be explicitly made for women but still work well. Even though the new tools haven’t eliminated her chronic knee, back, neck, and wrist pain—thanks to years of repetitive movements and stress—Marvit hasn’t had any new injuries since making the shift. Adams and Brensinger taught her that caring for her body is as important as caring for her crops. I love your hand tools! They are great and even help me with my vertical gardening using Living Ledge Vertical Garden containers that I invented. you women make a difference. i love gardening and can do very little now due to back problems. Thank you for addressing this difficulty that we all have to face. Oh my, oh my! Where have you been this past three years! Can you adapt a farm and send us tools? I can't break another leg. This is our third year of backbreaking work with nature and we could use some help. Your gifts/collection will do. Thank you.